I have been up and down Andersons Tk with no problms in the dry months. But after winter it is a different story. 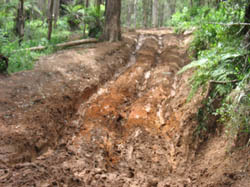 This track is rated at Very Difficult and last time required 35+ tons of lift and good MT tyres. We turned around early as it was clear most were not going to make it up. A good challenge for the well equipped.